Harry Sinclair Lewis (1885-1951) appears twice on this list, the first time in 1921 for his novel MainStreet. Between the publication of Main Street and Elmer Gantry, Lewis published his two of his seminal works, Babbit (1922) and Arrowsmith (1925). In 1930, Lewis became the first American author to win the Nobel Prize in literature. 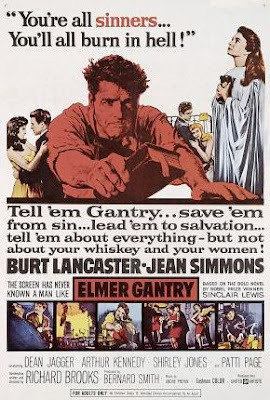 Elmer Gantry is a satirical attack on religious institutions of the early 1900’s. (In the name of journalistic integrity, I should point out that I am not religious but I will try to avoid putting any such bias in this review) The eponymous Elmer Gantry is a narcissistic, drunk, violent, womanizing college student who is convinced to join the church and over the course of the next twenty years, becomes the most famous preacher in the nation. While publicly a figure of righteousness and one of the most vocal detractors of anything sinful, Gantry’s private life and motivations are incredibly self-serving and hypocritical. He preaches because it gives him power over people. Elmer Gantry is a character you love to hate. His character exemplifies the state of religious institutions of the time. Uncoincidentally, the Gantry, after being kicked out of the seminary, becomes a salesman. Throughout the novel, the ability to earn money for the church (and himself) becomes first and foremost of Gantry’s concerns. Likewise, the religious organizations (Gantry starts as a Baptist, becomes an Evangelical, and later a Methodist) feel the same way. Throughout the story, the preachers that honestly believe and live by the bible never get to preach anywhere above small towns or poor districts in the cities. The preachers who are a help to their community are also unable to get assigned to a large church and are frequently non-believers. Strangely enough, Gantry believes (or at least believes that he believes) in the bible. This is important. One of the beliefs that Gantry and the other preachers have to affirm time and again throughout the novel is that salvation is guaranteed through faith, not good works. Elmer Gantry does bad things all the time but has faith. The controversy over Elmer Gantry was widespread. Preachers routinely and vehemently denounced the book. The then-famous evangelist Billy Sunday shouted that he “could have socked Mr. Lewis so hard there would have been nothing left for the devil to leap on.” Sunday may have had good reason to be angry, because the similarities between the then famous preacher and Gantry were many. Sunday was one of two people who were in particular lampooned in Elmer Gantry. The other was Aimee Semple McPherson who appears in the novel as the revivalist Sharon Falconer. Like Falconer, McPherson led a series of tent-revivals across the nation, incorporating myriad forms of entertainment into her meetings. Like Falconer, she also claimed to be a faith-healer. Falconer, like McPherson, built her own large church. Whereas Falconer’s burnt down, McPherson’s still stands and is the headquarters of an eight million member international Christian denomination. After the initial controversy died down, I can’t imagine that Elmer Gantry would continue to revel in mainstream appeal. While other bestselling novels on the list (The Inside of the Cup, for example) challenge religious convention, they conclude by praising the religion and its practitioners, even if criticizing certain practices. From what I’ve seen so far, for a book to remain popular, it has to do at least one of a few things: a) get taught in schools (e.g. The Grapes of Wrath) b)have an author that has remained famous (e.g. Dharma Bums) c) have a popular film adaptation (e.g. The Godfather) d) garner a cult following (The Lord of the Rings, before the movies) or e) become regarded as ‘a classic’ (e.g. Absalom, Absalom). While Elmer Gantry had a fairly popular film adaptation in 1960, the novel is far too controversial to get taught in schools, Lewis has himself declined in popularity, and there does not seem to be a strong community centered around Lewis’s works. However, with certain changes in popular ideology, I would not be surprised if Elmer Gantry didn’t have a bit of a revival in the coming years. Yes. Whatever your opinions, politically or religiously, Elmer Gantry provides a look at corruption and mass deception that is both incredible and down-to-earth. Lewis, Sinclair. Elmer Gantry. 1927. New York: Dell Publishing Co. 1960. Schorer, Mark. 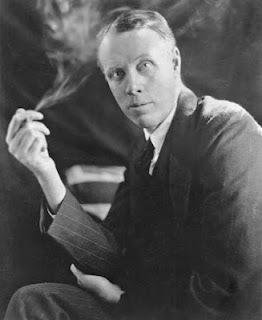 Sinclair Lewis: An American Life. New York: McGraw-Hill. 1961. Print. Sinclair Lewis was never a subtle writer but Elmer Gantry is pretty hard hitting. Thanks, It is now on my Kindle waiting for me to read, I am enjoying your reviews. The popular figure who lectures others about morality while acting corruptly in his own life, and protecting himself with his money-raising skills, is probably an evergreen character--in literature and life. One thing that's eerie about Lewis is how many of the books that he wrote in the early 20th Century are relevant in the 21st. Or maybe that's not eerie so much as just a side effect of keying in on certain fundamental aspects of human nature. Finally finished Elmer Gantry. It took awhile but it was worth the effort. I had seen the Burt Lancaster movie many years ago but don't remember much about it except the ending. The movie, as I remember, has Gantry paying for his transgressions in the end. The book ending is different, and I think better. Gantry is almost brought down, but survives to preach again, his eyes already on a new pretty girl.